In his Second Inaugural Addresses, Lincoln spoke of the necessity of caring for veterans of the Civil War, and for their widows and orphans. Iowans anticipated this need in 1864 by providing a private soldiers' orphans home in Van Buren County. 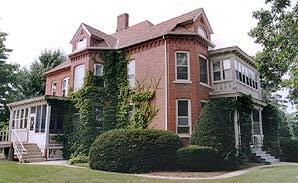 This home proved inadequate, however, and a commission was called at Marshalltown in 1865 to remedy the problem. Cedar Falls' delegate to the commission was Peter Melendy, a prominent local businessman. Melendy was an eloquent and forceful spokesmen for the advantages of his town. Largely through his efforts, Cedar Falls was chosen as the site for a new orphanage. The Soldiers' Orphans Home was temporarily located in a three-story former hotel at Fifth and Main. The building was refurbished through local donations and made ready in October 1865. Arthur Morrison was the first superintendent, and by the end of 1865, there were 96 children living at the Home. The enrollment grew rapidly during the following year, and the need for a larger building became apparent. This was accomplished through both private and state funding. Local citizens provided a 40-acre tract of land southwest of town, while the state appropriated $25,000 for a building, staff and support. Central Hall was used as a classroom and office building until 1965, when it was destroyed by fire. Today, nothing remains of the Iowa Soldier's Orphans Home building, but its legacy is the University of Northern Iowa.